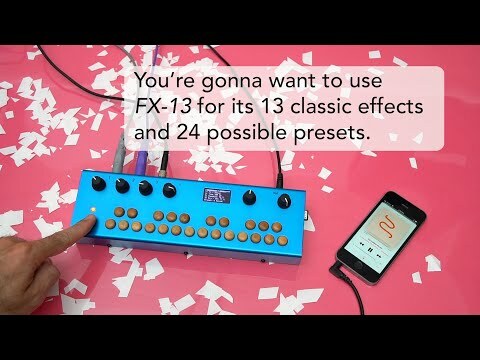 You're gonna want to use FX-13 for its 13 classic effects and 24 possible presets! Quickly select effect, change effects settings, and jump to presets. A multi-effects patch with 24 presets (one per key). It is all about quickly selecting an effect, changing the effect settings, saving a new preset and then jumping to other presets. Perhaps designed for those with ADD and those who enjoy exploring new takes on their sound. If you press and hold ‘Aux’ button and then press Key 1, you will enter Mono mode which sends a mono signal (Tip-Sleeve) out both left and right outputs. If you press and hold ‘Aux’ button and then press Key 2, you will enter Stereo mode which sends the signals out their respective left and right outputs. 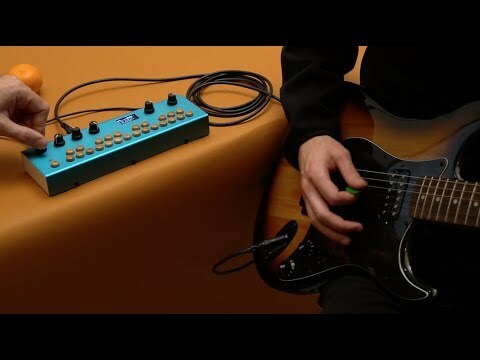 Knob1 chooses effect: reverb, delay, spectral delay, pitch shifter, chorus, flanger, phaser, bitcrusher, tremolo, LFO filter, panner, and two distortions. The other three knobs control effect parameters. Once you like your choices, save it as a preset by pressing the Aux/foot switch. 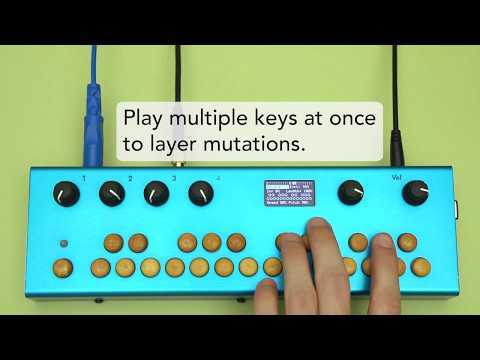 Tuned Delay turns a sample-player into a synth with tuned delay feedback. A percussive sample is fed through a delay line that is tuned to the keys, pitching the sound. Choose between one of four samples. The effect is similar to the famous plucked string algorithm. 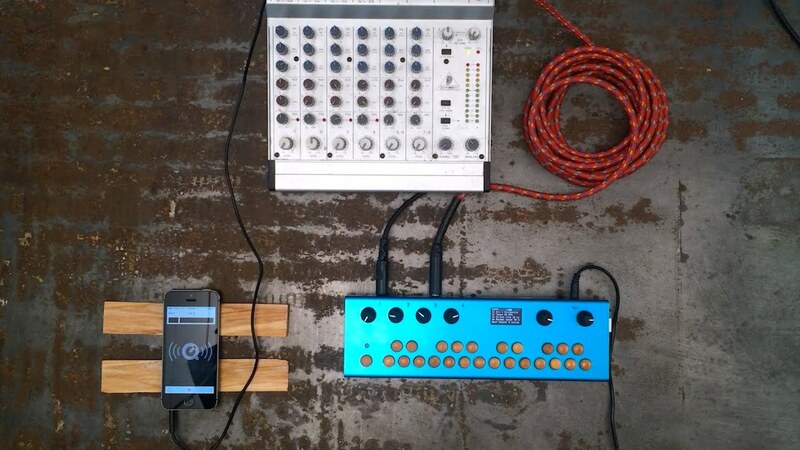 The more you crank the feedback, the more synth-like the sound becomes. 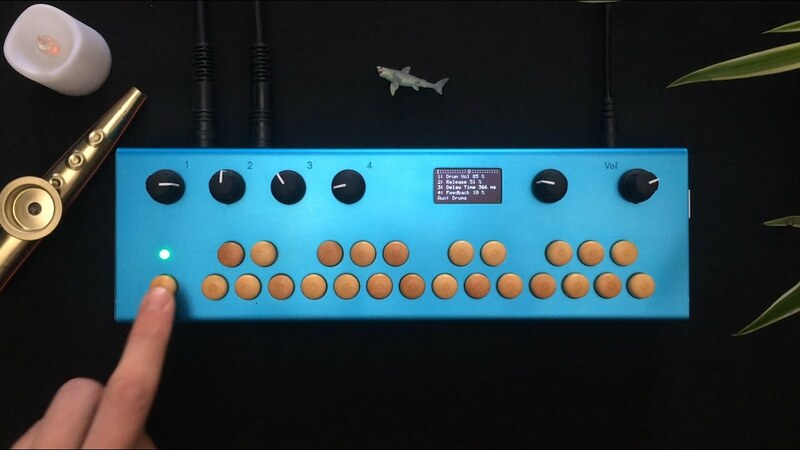 Tuned Delay also features a built-in sequencer. Play elements of a song over a backing track. Play a song on the fly! Live remix it! This patch shines when you load your samples into it (44.1KHz / 16-bit / .wav) The Aux button toggles a background/drum track (should be called 'drums.wav'). Each keyboard key controls a sample (1.wav - 24.wav). The knobs allow control of the background track volume and sample playback decay and a delay line for extra fun. The background track is streamed from disk so it can be as long as desired. The key samples get loaded when the patch begins, so they should be shorter (under a minute). 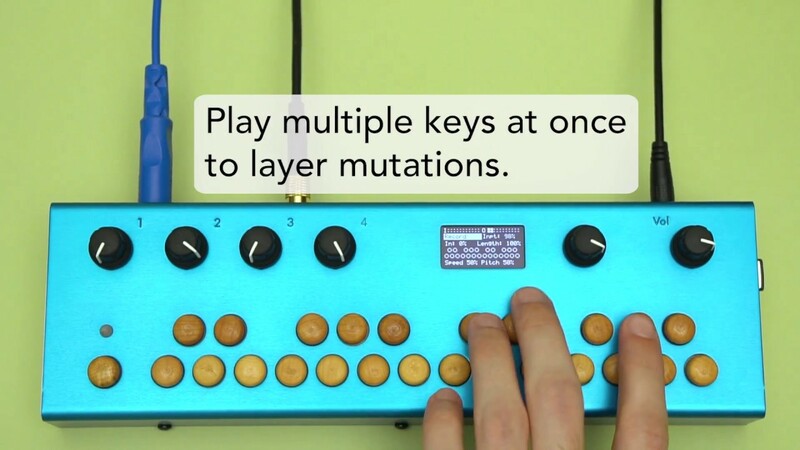 Incoming sound is turned into a cloud of small grains that can be played with the keyboard. 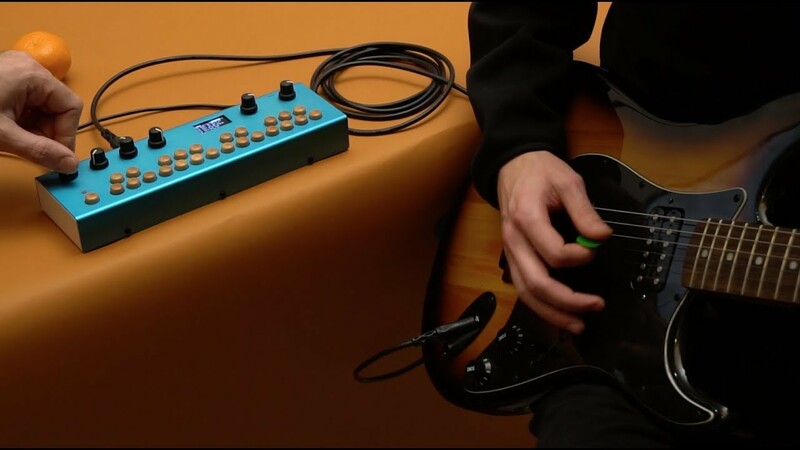 Control the size and density of the cloud (Knobs1-3) and transpose the notes using the keyboard. Freeze the cloud by pressing the Aux button or foot switch. 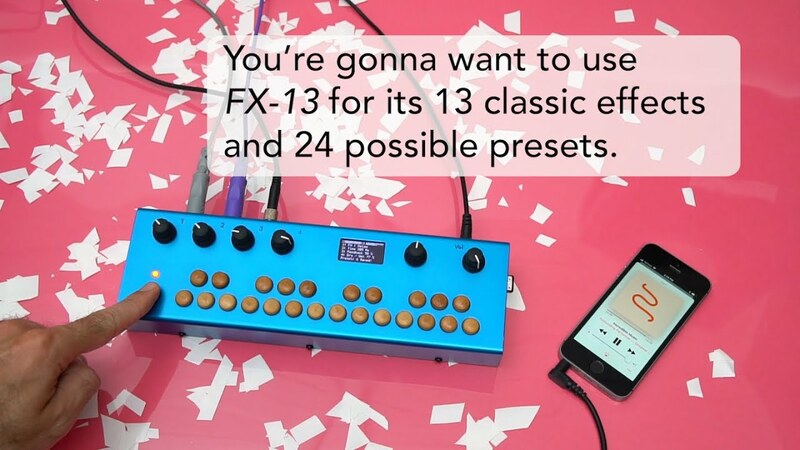 Control the pitch of the frozen cloud with the keyboard and use Knob4 to control the mix of the granulated and incoming sound. 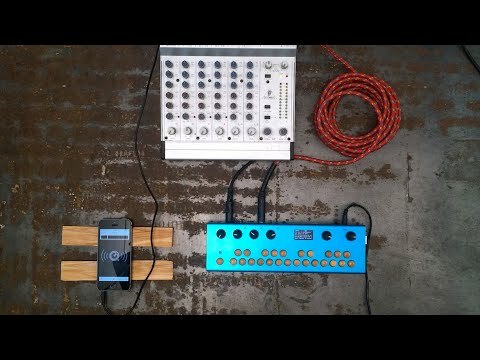 Aux and Foot Switch: Freeze/Unfreeze grain cloud. Plays and sequences 24 samples with a delay. Nearly identical to Sampler Style. Each key plays a different sample. The bottom keys are mostly drum sounds and the top keys are more sound effects. You can replace the samples with your own. The Aux button controls a sequencer: hold it down to enable recording, begin playing to start a recording, and press Aux again to finish. Wepa! plays back a sample, pitched based on which key you play. Holding a key loops sample playback. There's delay too! Change the .wav file in the patch folder to play your own sample. Really just a great way to build up a deranged stack of sound. Audio input is fed through four delay lines, each with a delay time that is a multiple of a root delay time. The root delay time selectable with the keyboard (Low 'C' key = 0ms delay. High 'B' key = 918 ms delay). 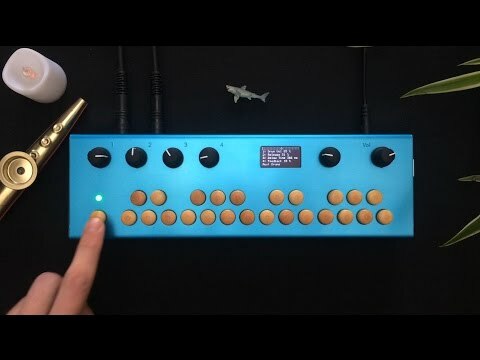 Knobs control feedback. One knob for each delay line.